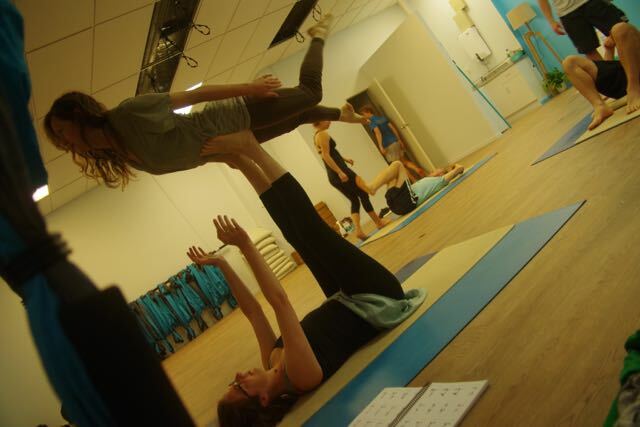 I’d only been here for a few days when there was an acro-yoga class in the city that a few of us were keen to take. Since buying a car when travelling New Zealand is a popular activity, one of the interested parties had wheels and we hopped in, eager for our acro adventure. Though we ended up crashing an intermediate class that should definitely have been labeled an advanced—I mean really, they were inventing flows between poses with strange names when we barged in a few minutes late—we had a lovely time with a great friendly bunch. Basing Anna, the girl with the enthralling Southern drawl. After a beer and a twenty-minute drive we arrived back home in our wwoofer den, a cozy, low-ceilinged basement space with lots of comfortable couches and about eight fridges for the twenty or so of us. As I walked in I headed straight toward the sink for a drink and mid-way there this rush of a feeling came over me. No, it wasn’t the beer, it was this sense of familiarity. As a traveller I’m used to putting myself in completely new situations every single day. Every bus ticket, cup of tea, piece of fruit, everything, is acquired for the very first time. There’s no autopilot as I walk into my regular grocery store and head to the correct aisle. When I’m travelling I have to read every sign and search for what it is I’m looking for. In fact, today I had to ask a store clerk where the rice was. I was in an Asian grocery store. Anyway. I put so much energy toward figuring things out that when I walked into that kitchen I’d prepared less than a dozen meals in, a sense of home filled me. It was a lovely feeling. I recognize how the need for that feeling is a universal human experience and that everyone creates it for themselves in different ways. Some people surround themselves with furniture they’ve purchased in a house they have their name legally associated with. Others will find it anywhere they go. On September 8th the Yasodhara Ashram celebrates our lineage. It marks Swami Sivananda’s birthday and is a day we honour our teachers. After a few seasons away I was happy to be able to return to the Ashram over the celebration weekend. The question we were encouraged to reflect on was “What do I want to initiate?” For me the answer came quickly: I wanted to initiate a mantra practice that would carry me as I navigate this world out here. October 17th marks the 40th day of my practice (minus that pesky day that disappeared when I flew over the international date line) where I sit in meditation every evening before I sleep, passing my mala beads through my fingers. The sense of home and familiarity as I imagine myself shrouded in light is phenomenal. The sense of home I can get wandering into a kitchen I’ve used for a few days is relatively shallow when compared to the depth of feeling I get from my practice, yet I know they stem from the same source. Through knowing myself I can go anywhere and feel at home. I’m grateful for those around me who reflect back at me even more facets of myself. I’m grateful for knowing that home is where my heart is.